In Ep. 64, Tim talks with Stephen Nelson. 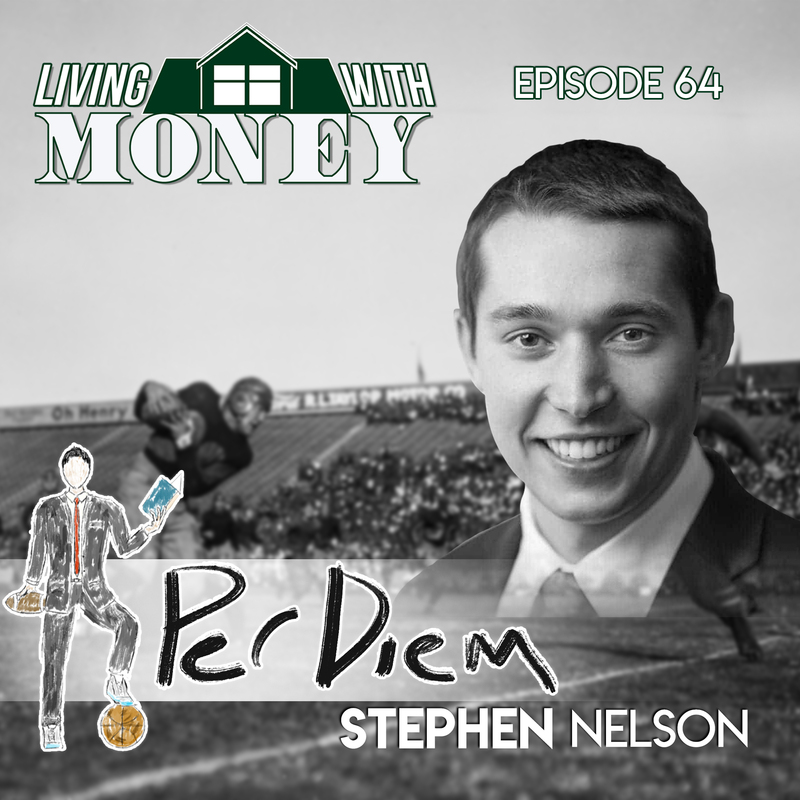 Stephen is a CFP and writes for the Per Diem blog. They discuss Stephen’s background as a student-athlete, the importance of diversification and asset allocation when investing, how perspective can change an investor’s behavior, the most important lessons Stephen’s learned on and off the field, and more! Tim Mullooly: Welcome back to Living With Money. This is Tim Mullooly. On today’s episode, I am joined by Stephen Nelson. Stephen is a CFP, and he writes for the Per Diem blog. Stephen, thanks for coming on the show. Stephen Nelson: Thanks for having me, Tim. Tim Mullooly: Let’s start by telling the listeners a little bit about your background. You know, where are you from? Where are you located now? What’d you study in school, and you know, kind of how did you get started growing up? Stephen Nelson: I’m originally from Portland, Oregon. So shout out to Rip City. And currently now I’m in a small town north of San Diego, Carlsbad. Kind of how I ended up here was through college, essentially. So I went to college out of state. I kind of wanted to try something new, outside of Oregon. And really my dream was, I mean I grew up playing a whole slew of sports, but I really wanted to play D1 football, and also attend a good school. I wasn’t really recruited out of high school, so I did normal school visits like anyone else. Whenever I visited a school, I always kind of made a point to swing by the football department and try to talk to a coach or an administrator about walking on. There was a school in Texas called SMU that had just hired a new coach from Hawaii, his name was June Jones. And he kind of came with a reputation of, in a sense, an open policy towards walk ons. And also SMU had a really great business school, so it was kind of a fit of both things. That’s what kind of led me to SMU. As for what I studied, it was kind of a process of elimination. I know I didn’t want to do accounting, or marketing, or management, so I said, “I guess I’ll do finance.” That’s kind of what I fell into, really. Tim Mullooly: Awesome. I take it you ended up walking on … trying to walk on to the football team at SMU? Stephen Nelson: Correct. Yeah, so that was a crazy experience. Getting accepted into SMU was kind of the first step, but being a part of the football team was something completely different. They have a process for walk ons. You can either be a preferred walk on, or just kind of the regular student body, if you will. So a preferred walk on, they get invited to fall camp. They’re part of the team kind of from the beginning. They’re just not on scholarship. Tim Mullooly: Introduce yourself a little bit. Stephen Nelson: Yeah, yeah. And then from there, found my way onto the team and had a really great experience. Tim Mullooly: Well that’s awesome. So I saw on your website that you talked about an ESPN 30 for 30 called Broke, and it kind of brought you to a realization during college. Do you want to talk about what hit home for you specifically about that documentary, and kind of how it jump started your career in a sense? Tim Mullooly: Definitely. Not only benefit you, but also be able to benefit your friends, and teammates, and people close to you like in a very direct way. Two of your most recent posts on your blog just happened to be two of my favorite that you’ve written. The first one … it’s kind of in a sense almost like a two part post. The first one compared the game of basketball to asset allocation for an investor, and the second one compares basketball again, but this time to diversification instead of asset allocation. Can you break down those two posts? You know, first about the asset allocation, and then kind of how it built into the second post about diversification? Stephen Nelson: Right. Yeah, certainly. Well, first of all, I’ll say that the whole point of the blog I write is just to explain investing in a way that’s simple and fun. And for me that’s through sports. It’s something that I can relate to, and I hope other people who enjoy sports can relate to it as well. So yeah, so the whole point of these two posts was taking just these kind of concepts, are kind of fancy. And so the first one was this asset allocation, which is a huge tenet in finance, but it can lead to a lot of head scratching just because, I mean, it’s a fancy pants term. It really matters because it helps you determine how to set up your 401k, or potentially what you could lose in the next market downturn. To explain this, I think just using the game of basketball just makes it hopefully really simple. Tim Mullooly: The more traditional sense, yeah. Stephen Nelson: Exactly. And everyone who’s played basketball, or who knows basketball is like, “Yeah, that makes sense.” My question is why does that make sense? Why not play five guards, or five forwards? The answer is, well, each position offers something a little bit different. You know, guards are really good at scoring and can handle the ball really well. Whereas centers can rebound, block shots, and do that sort of thing. So each position has a benefit they provide to the team, but then there’s also weaknesses to each position. So if, I mean, if you had five guards playing on the court at the same time, five Damian Lillards, you might be able to score a whole bunch of points. But who’s going to stop Joel Embiid from dunking on you every play, or who’s going to stop Rudy Gobert? So the whole point, and what a team tries to do, is maximize the strengths while also minimizing the weaknesses of each position. And if you kind of relay that into finance, we have three main positions as well. And we call those positions asset classes. And those would be stocks, bonds, and cash. So stocks are like guards, they can score quickly, or they can have an off shooting night and you know, be a dog. Forwards are more like bonds, a little bit more steady. And then centers are kind of like cash. You know what you’re going to get, you’re going to get your four points a night, 10 to 12 rebounds. The interesting thing is that basketball games aren’t won by the team that scores a hundred points first. There’s no, that’s not a rule of the game. It’s the team that plays offense really well, and defense really well. And that’s kind of what you’re trying to do with a portfolio. You’re not trying to pick Apple, Google, and you know, see how quickly, or how high they can score. The point is actually winning the game, or achieving your financial goal in the most efficient way possible. Essentially, I mean, just in summary, asset allocation is just like choosing the starting lineup for a team. The second one, diversification, parallels from the first topic, asset allocation, or the importance of that is really worthless without diversification. You know, asset allocation tells you how much of each asset class to hold, but it doesn’t tell you what investments make up those asset classes. You could have an allocation of 70% stocks, 20% bonds, and 10% cash. If the only stocks that you own are Apple and Nike, then if something were to happen with one or both those companies, you’d be in a world of hurt. The analogy with basketball is, well let me take the Golden State Warriors, which is just a basketball team that usually everyone knows all the players are. So you have Steph Curry, Klay Thompson, Kevin Durant, Draymond Green, and Demarcus Cousins. Why doesn’t Steve Kerr, the coach just play them every single game for the whole game? Don’t we all want to see Curry drop 60 points every single night? I mean, he’ll do that if he’s playing for the full game. But what you won’t see is them reaching the NBA finals, which, you know, because they’ll be so tired by the end of the season that … or injured, or something like that that they won’t be able to perform. Ben Carlson, who is a phenomenal writer and blogger says it really well, that diversification is accepting good enough, while missing out on extraordinary, so you can avoid terrible. So how do the warriors basically use the concept of diversification? Well, they have subs. They bring in Andre Iguodala, Shaun Livingston, Jordan Bell to give the stars a break. The same exact thing. They give up on Steph Curry scoring a lot of points in order to make it to the NBA finals. They miss out on the mountaintops in order to avoid the valleys, if you will. And relating that to finance, instead of just owning two stocks, why don’t you own all 500 of the largest companies in the US? Tim Mullooly: Absolutely. Another one of your posts, it was titled The Game Is Different. You talk about how the perspective kind of changes from when someone goes from being a player in a particular sport to being an announcer, and how the perspective changes. And you compared it to Tony Romo being this prolific play caller in the booth, and you tie that into investing, and how investor’s perspectives can change as well. Do you want to talk about that parallel that you drew between the change of perspective between players, and announcers, and investors? The difference is really about perspective. From the viewpoint that Tony Romo has up in an announcer’s booth versus what football actually looks like on the field. And they are two totally different things. I always hated in film sessions when we were reviewing either practice tape or game film tape, the coach would be getting on me for not breaking a route at the level of the corner, and that sort of thing. And I’m thinking to myself like, “Coach, like I’m just trying to not get slammed by this linebacker. Like I can’t see the corner over there.” You know, down on the field, it’s a little … I mean, it’s very chaotic. You’re going against a defense that’s trying to shove you down, and not let you get to where you want to go. Mickey Mantle said it really well. He said, “You don’t realize how easy this game is until you get up in that broadcasting booth.” And of course he was being facetious. But you know, the game of football looks really easy when you’re watching game tape, or watching it from the seat of your couch, with DVR and all that good stuff. But you know, it’s really difficult down on the field. And I think the parallel to investing is you can read all the white papers that you want, and all the books, and I totally encourage people to do that. I think that’s a really good use of their time. Everyone knows what the right thing to do is. Invest for the long term. Don’t panic. Everyone knows that. But it’s easy to kind of gloss over the fact that it doesn’t matter what you know in a clean, out of sample environment. What matters is what you actually do when you’re playing in the game and things get crazy. Tim Mullooly: I totally agree. And so it’s all about that real world application of whether it’s sports or investing your own money. A lot of things are good in theory, but much more difficult when you’re actually like boots on the ground, doing it yourself. Tim Mullooly: The first post that you wrote this year in 2019, I really liked. It was you know about emotions that come along with picking stocks, and being able to beat the market. Do you want to talk about the analogy that you tied in with the Floyd Mayweather fight? Why you think people continue to pick stocks even though they know they’re going up against a giant opponent in terms of being able to beat the market? Stephen Nelson: Tim, have you heard about this fight? This Mayweather, Nasukawa fight. Tim Mullooly: I honestly, I did not. I didn’t know it was going on until I read the post. Stephen Nelson: Right, yeah. I didn’t know about it either, and I think I just stumbled across it because it was kind of kept on the DL. But I mean this was a fight that happened a New Year’s Eve, over in Japan. And it was between Floyd Mayweather, who’s undefeated, and this Japanese kickboxing star, his name is Tenshin Nasukawa. He was undefeated in his own right. The whole premise of it is, if I was a young kickboxing star, sure, I want to take on Floyd Mayweather, and see if I can have a shot at topping the king. If you do it, then think of all the praise and boost to the ego that it’ll give you. I think the same thing, trying to pick stocks, and playing that game is, yeah, we’d all like a shot at beating in the market. Or we’d all like to be the next Warren Buffett. Be the person that everyone kind of looks to and says like, “Oh, you did such an amazing thing,” or, “You did something that was really hard.” The question that we ask ourselves is, why do we think that, and why are we so drawn to, almost in a sense, punching above our weight. Tim Mullooly: Yeah. They want an ego boost, or something. Stephen Nelson: Right, right. And even though that the evidence is very clear that people that that trade a lot end up performing worse. I think that’s fine because you are getting a benefit from it. But just, I think it behooves you to know that it comes with a price, and that price being lower returns. There’s someone else on the other side of that trade that has more information, more skill than you and I buying stocks on eTrade. Nasukawa found that out kind of the hard way. One of the emotional benefit, the notoriety of the fighting Floyd Mayweather, and potentially winning. But then if you actually go and watch the fight, it was a straight up embarrassment. It was over in two and a half minutes. Tim Mullooly: I want to go back to the very first post that you put on Per Diem. It was a couple years ago, and you talked about the story of the NFL player, Brandon Copeland, and creating options for himself. Do you want to tell the listeners about the story of Brandon Copeland first, and then kind of what his story meant to you, and what you wrote about? Stephen Nelson: Yeah. And this is pretty timely, because I think Brandon just re-signed with the Jets. There was a, I think a more recent article about him, kind of what he’s doing in addition to what he did before. But basically he went to school at Penn. He was someone that was thinking already that football is not going to be something that lasts forever. So he took it upon himself to go out and get an internship with some type of financial services firm, or someone. But he did an internship with them, and got to know or learn something outside of football that he could potentially fall back on. Also, I can remember reading that he just did a really good job of saving, and I was just super impressed by his habits. I think he said that he invests like 60% of his after tax salary, saves 30% of it, and then lives off the remaining 10 to 15%. Just really impressive. And now I think he teaches as an adjunct professor at Penn, kind of trying to pay it forward, and teaching young college kids about saving, and investing, and that sort of thing. I think the thing that I just took away from it was … or the thing I really wanted to share with people was that football, is something that’s going to end. You can’t wait for the day when you get called into the office, and they tell you’re off the team to make your decision about what you’re going to do next. You have to be constantly kind of thinking about what’s going to happen once, when I’m done with football, before you even get into a situation like that. I think the thing that he did really well was he obviously saved a lot of money, so even if he didn’t re-sign with the Jets, he’s got savings, and he’s got options. He doesn’t have to go scurry about and find a job right away. He can take his time, if you will, and find something that he really loves to do. Also, I was just really impressed with how he’s built relationships outside of football. And in business, relationships are pretty much everything. Yeah. I was just really impressed with this story, and just really wanted to share that with as many people as I could. So Kudos to Brandon Copeland. Tim Mullooly: Yeah. You know, I feel like it’s a great message for student athletes, but it really can apply to anyone. I mean, if you are planning on leaving a career, or leaving a job, whether it’s in sports or just in everyday life, you either don’t want to work anymore, or you want to switch jobs. Like this is something that you need to plan for. So I think that that story kind of reaches all different facets of life outside of sports as well. Tim Mullooly: As a former student athlete, what would you say to any current student athletes that are trying to figure out how to get ready for life after sports, and life outside of school? Stephen Nelson: Yeah, it’s very easy to be in kind of the student athlete bubble. Pretty much everything’s … I mean, your schedule is made for you, and you have to be at class, at workout, at film study, games, practice, all that sort of thing is laid out for you. So I think it’s on the individual, and what I would really encourage student athletes to do is to meet people outside of their sports. So make friends outside of the sport that they play. And I think that’s just like one really simple way to expose yourself to other people, and other ideas, and what they’re up to, versus just kind of being in athlete land for your whole time. One of the things that I would really recommend would be to do an internship with someone during the summer, and usually companies are pretty flexible with student athletes, and the time demands on them. So hopefully you can find a company that is willing to work with your schedule. I think a lot of people wonder like, “Well, I don’t even know like what I should do, or what I should … what company I should approach.” It’s kind of like just choose something that you’re remotely interested, and do the internship. And if you hate it then you found out something you don’t want to do. But at the very least, you know, you’re in an office environment or something like that where you have an understanding of just what normal people do for work. It’s not just all sports, and working out, and drinking protein shakes. And I think that’s really important for student athletes to know, and to hear. I did an internship, it really only ended up being a month in the summer, just for a couple hours each day during the week. I mean it was everything. It was like … it was life changing. I mean, I got to experience thankfully an inside look at wealth management firm, and got that experience while I was in school. And that was really helpful to know what to look for when a football was done, and I wanted to start a career of my own. Tim Mullooly: I feel like that’s really good advice, to kind of just expand your horizons, kind of take a step out of the bubble, and kind of put your foot in another door. Stephen Nelson: One thing more I’ll add is to talk to people who support the athletic department. You can think of like boosters, or donors, or that sort of thing. Obviously don’t take money from them, or you know, you can’t even … it’s crazy. The rule is, they can’t even pay for your Chipotle burrito if you grab lunch with them. So don’t do anything like that, that would risk your eligibility. But, I mean talk to those people. Like those people are successful business people, or you never know where that might lead. Tim Mullooly: Yeah, definitely. Kind of segueing somewhat nicely there, I feel like some of those donors might be the people that are screaming to fire a coach when the team is underperforming. That kind of brings me to my next question, and you know, another one of your posts was talking about why you thought firing the coach makes no sense. Obviously there’s a clear connection there between sports managers and investment managers, or advisors that you’re working with. Why do you think that firing the coach in sports makes no sense? Stephen Nelson: I was really actually surprised to find the research on this. Basically the teams that fire their coach, or replace their coach end up doing, on the whole, no better, or actually worse than teams that retain their coach. I mean, when you think about it, like it does make sense for this to be the case. And I hate to make this analogy, but it’s really like a divorce, and the players are the kids when a coach gets fired. When you think about who is actually producing, and being the … who makes up the team, it’s not the coaches, the athletic director, the boosters, and the alums. It’s the players. They’re people, and they’ve been recruited and conditioned to behave and train a certain way by someone, and then someone new comes in and has a completely different perspective. It’s really hard for players. I went through a coaching transition and just saw the effects on my friends, and that sort of thing. And it’s really easy to just to get lost in that transition. And obviously in some cases a new coach is a really good thing, and it ends up working out. But on the whole, kind of a detriment to really the players. Going back to, okay, like why do people do this then? And I mean, it’s the same thing for investing. It’s, we’re always chasing after the next best thing. The average investor’s returns underperform the returns of the funds that they’re actually invested in. I know Carl Richard calls that the behavior gap, if you will. And it’s because we’re always trying to switch when something’s doing poorly, and jump into the hot new funds, and that sort of thing. And then once we do, then that fund goes on to underperform, and it’s just a rat race. Tim Mullooly: … as opposed to actual value. Stephen Nelson: Yeah. Because there’s always … I mean, I’ll admit SMU has had some really great years, but then also some really bad years, where we haven’t won any games, or won one game. But every single fall there’s the post, people on the message boards and whatnot saying you know, this is the year. It’s going to be different. And you know, hope springs eternal with a new coach, with the new season every single year. Tim Mullooly: Definitely a clear connection there between you know, what actually adds value and what doesn’t. So it’s important to know that distinction going into it. I wanted to ask you a couple questions about lessons that you’ve learned throughout your life. First being, what’s the most important financial lesson that you’ve ever learned? Stephen Nelson: Most important financial lesson that I’ve learned. I’d say it’s actually two lessons. One, and it’s really simple, but I think it just makes a world of difference. For me, it was, pay cash for the things that you want. And then the second piece would be to start early. And I think for how I learned that, well one it was, we had one of our donors whose name is actually on the building at SMU come in and speak to the team. He’s this billionaire oil guy, and his money management advice was pay cash for everything. So I thought, hey, that’s good enough for him, it’s probably good enough for me. And just kind of being a nerdy math guy, the fact of paying more for something due to interest on a credit card, which was kind of enough to steer me away from that. So just building that habit of always just having cash if you want to buy something. And if you don’t, then don’t buy it. The second piece of just starting early, and I think just seeing the power of time in the market, and the power of compounding, is just something that was … just seeing kind of that chart was a big catalyst for me of just being like, hey, you should just start it now. And you know, in 30, 40 years, most likely things will have grown, and it should be pretty substantial. So those are kind of the two financial lessons that I think I’ve learned, that I’ve tried to stay pretty steady on. Tim Mullooly: What about the lesson that you learned on the football field? I’m sure there were plenty throughout your years playing. Stephen Nelson: There’s countless things that you can learn from sports. I think the main one was loving the process. And I know that’s pretty familiar to 76ers, and saying trust the process. What I mean by process, and with sports, there’s … you don’t just show up on game day and perform incredibly. There’s this process that you have to go through, or just this mundane … things that you have to do, that over time allow you to achieve some really, really incredible things. To be a great athlete, you have to love lifting, and love working out. You have to love practice. You have to love … for me, getting your stance right, and lining up correctly, seeing how the corner’s playing you, and what leverage he’s using, and that sort of thing. You have to love going to film every day, breaking down all the things that you did wrong, and all the things that you can do better. I think that it’s the chase as much of the capture that’s gratifying. You know, if you don’t love like what you’re doing each and every day, you might be doing the wrong thing. You know, I think that’s when you find just real excitement and real joy in … throughout the process. Like, winning is awesome, you know, it’s great to go to a national championship, or win the Heisman, or that sort of thing. But that doesn’t happen to 119 other teams, and thousands of other players. And that’s just reality. So are we all just failures because we didn’t achieve that goal? No, absolutely not. You’ve built something, and you’ve done things that in and of themselves are the reward. So it doesn’t necessarily matter that you scored 10 touchdowns, and that sort of thing. But it’s the fact that you showed up every single day and tried to get better. And I think that just translates really well into your career. Being a advisor or a financial planner, you can’t just love game day when you get to sit across from the client and tell them how great their retirement’s going to be because they can achieve all their goals, and that sort of thing. You have to love staying up on the current things going on in the planning community, and what’s going on in the markets. You have to love practicing, speaking with a client in a way that they understand. You have to be good at communicating, writing emails, and that sort of thing. Just all of those things that make up your day to day, culminate in a career, or a win, or helping a client achieve what they want to achieve. It’s all throughout the daily habits, if you will. So I think that was one of the things that I really took away from sports, and try to apply each and every day to where I am right now. Tim Mullooly: Definitely. That’s a perfect thing that translates right off the field into everyday life. I’ve got a couple more questions for you. If you could change just one thing about the way people invest, or something about the markets, or financial planning, what would that be and why? Stephen Nelson: I think my biggest frustration is wanting to get the client to understand some type of topic, or that sort of thing. But then them not even having the basics down. In football we call it the blocking and tackling, of just financial literacy. Just doing like a budget, and kind of knowing where the money’s at. And so if I could really change something, I wish that teaching finances was part of our high school or grade school curriculum. That’s really what I would do. It’s not so much changing about the way people invest. I mean, because people are going to sometimes invest the way that they want to, whether someone tells them something’s good or not, something about the markets. As much as I’d like to, I can’t control it. I think just having a basic understanding of money, and interest, and earning interest by saving, and budgeting, would just really, really go a long way for people, and for America, just as a whole for our country. Tim Mullooly: I totally agree. That’s something that I’ve talked with people on this podcast, and clients in general. So hopefully, in the years to come, that will be something that we can get done. All right, so last question. I like to wrap up every episode with this. We might have touched on it a little bit in the lessons that you’ve learned, but whether it’s a personal or professional thing, what’s the best piece of advice that you’ve ever received? The thing that I’ve just learned is it’s not about that. It’s not about being the best, it’s about you just getting better each and every day, in learning, and trying to better where you personally are today so that you’re better tomorrow. I just think that that’s really, really good advice for young people, just because it’s just so easy to get caught up in comparisons, and just trying to be great at everything, or something. And just want to know that it’s okay to not be. You just have to be, just get better for who you are. Tim Mullooly: Absolutely. Completely agree with that as well. Stephen, that’s all the questions that I had for you today. For the listeners out there, I will be linking in the show notes to the Per Diem blog, all of the posts that we talked about here. Plus there are many, many more on Stephen’s site as well for you to check out. So be sure to head over to the show notes and peruse all the other articles that we didn’t talk about here today. So thanks for listening to this episode of Living With Money, and we will catch you on the next one.